Cervical cancer is a leading cause of cancer death for women, causing more than 270,000 deaths globally each year. More than four of every five of these deaths occur in developing countries. The tragedy of this statistic is that it is one of the most easily preventable forms of cancer that affect women and training health care workers in simple procedures can save thousands of lives. To address this issue, International Medical Corps has partnered with CureCervicalCancer.org, a nonprofit organization that creates sustainable clinics in developing countries, to help stop these unnecessary and preventable deaths by training local health workers. “When the CCC team leaves, the equipment and local training remain in place to continue the fight against cervical cancer,” says the founding director of CCC, Dr. Patricia Gordon. The two organizations have partnered in two countries with some of the highest rates of cervical cancer in the world–Haiti and Kenya. A study from the University of Manchester in the United Kingdom found that less than 7% of cervical cancer patients in Kenya receive proper treatment to help eliminate the disease. Cervical cancer intervention in Kenya is a necessity and International Medical Corps and CCC have joined forces to scale up cervical cancer screening and treatment in 10 clinics in Kenya with the goal to screen and provide treatment to 10,000 women in 2015. Edna Gakii, a health care professional with International Medical Corps for the past nine years in Kenya, has worked with many women receiving HIV treatment, family planning, counseling and STI treatment. However, she wanted to do more for the women of her community and eagerly received the training from CCC on cervical cancer screening. Edna is actively involved in screening and treating women in need and is especially committed to treating HIV positive women — women she knows benefit greatly from the screening because they are most at risk. She is proud to work for International Medical Corps which now has many clinics across western Kenya staffed with healthcare professional who have become experts in screening for cervical cancer. 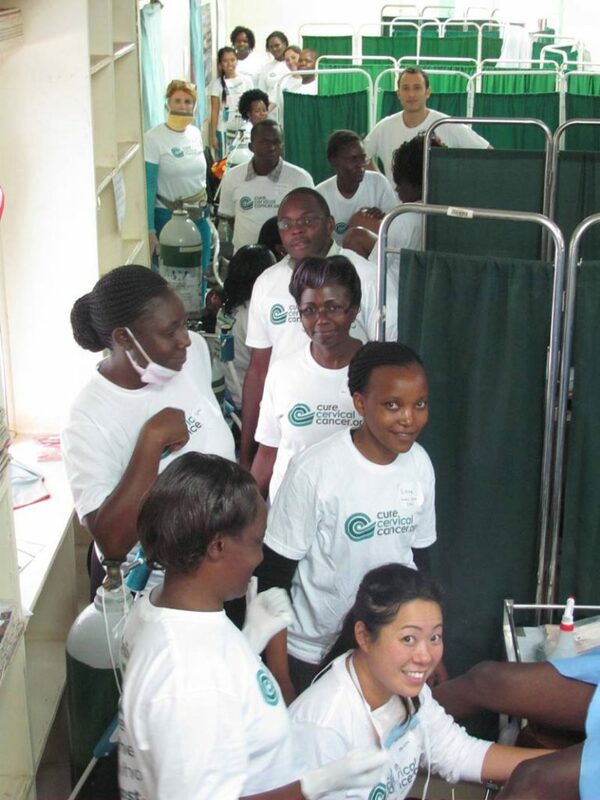 One such clinic is the Langata Health Center in Nairobi located near the city’s sprawling Kibera slum. The women who seek medical care at this clinic are extremely impoverished and most have never had a pelvic exam. International Medical Corps worked with the CCC team to train healthcare professionals at this health center on their method called the “See and Treat” procedure. They screened approximately 300 women in the first week alone. In their Haiti partnership, Internationals Medical Corps and CCC have established a permanent, sustainable program for the early detection, prevention and treatment of precancerous cervical lesion at the Hospital Fort Saint Michel in Cap-Haitien, training nurses at the hospital in the procedure. Since the 2010 earthquake, women’s health needs have fallen as a priority in in Haiti and International Medical Corps is proud to help reverse this trend. Cervical cancer can be prevented with an easy and inexpensive screening technique. However, once pre-cancerous lesions become invasive, highly complex and expensive treatment is required which very few women around the world can access. Death from cervical cancer is slow, painful and bloody. There is no need for women to continue dying from this horrible disease when such easy treatment is available.